Full opening zipper for shooting mat capability! The new innovative design from BlackHawk has all the capability that a true modular case should. This system is truly modular in that it can utilize the hook & loop pouches from many other cases and bags. Choose the size and accessories you want and need. The Homeland Security Discreet Case is made to all the same high standards as the original Discreet Case including the removable .375 inch closed cell foam padding, full 360 degree padding, full wrap around carry handles, #9 YKK zippers with silent zipper pulls, detachable shoulder strap and HawkTex shoulder pad. The middle of the case has two rows of BTS webbing and has fully expandable hook & loop wrap keepers for any rifle with accessories such as scopes, lights, lasers, rail mounts, etc. The outside zippered pocket is lined with a bed of hook & loop to attach to any BlackHawk hook and loop pouch. This is a great feature which enables you to carry the mags of your choice, scopes, pistols, or any accessories. Just hook & loop the pouch on and off. 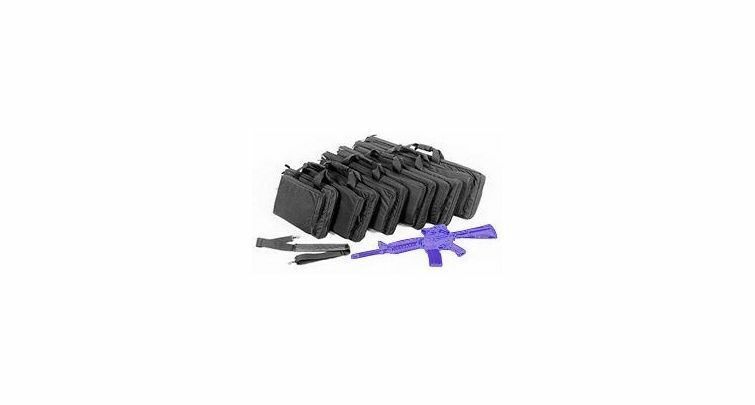 The removable mag pouch system fits (3) M-16 mags, (2) M-14 mags, (6) MP-5 9mm mags, hand-held radios, (3) G-36 mags, or (3) AK-47 mags, etc. This is the same pouch as our Omega Tactical Vest mag pouches with adjustable lids.